I've been trying to construct a review in my head for this book all weekend, having finished reading it on Saturday morning, but no matter what I came up with, I feel that it will not fully represent the feelings I had while reading this book. To say that I loved The Lover's Dictionary would be an understatement. 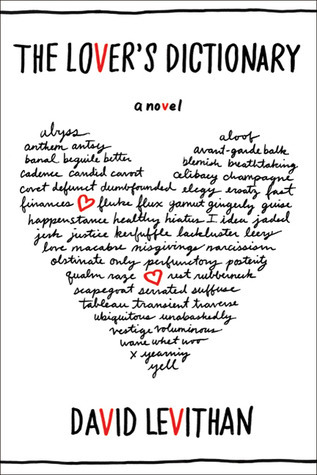 In a nutshell, The Lover's Dictionary is the simple love story of a couple, left unnamed by the author, told in dictionary form. Through carefully-chosen words, their love story unfurled: how they first met, how their shaky relationship evolved into something more solid, from their first date up to the time they finally made the big “C”, the obligatory ups and downs of their relationship. And even though their story is nothing exceptional, a love story not all that different from the next boy-girl relationship there ever is, the unique manner in which their story was told gave it such an unconventional flavor and offbeat feel, and it was for this reason that I loved it to bits. When I first heard about this book from Tina, my curiosity was piqued right away because she mentioned that it was all about wordplay. I have a thing about words being given a different definition or connotation other than their original meaning; I consider the people who come up with these things to be the smartest and wittiest ones, and I admire them immensely. 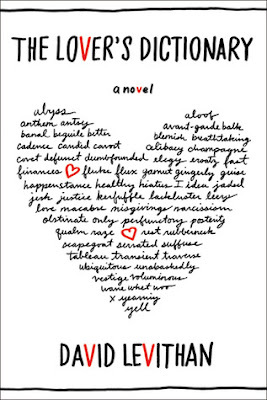 So when I realized that this book is a novel that was all about wordplay, I was hooked. Plus, when I started devouring the first few pages of the book, I knew I wasn't looking for a love story to read, not really. But when I finally closed the book with a satisfied sigh, I again realized that I haven't read a romance in a long, long time, and The Lover's Dictionary is just about perfect for the purpose. Another thing that I loved about the novel was the fact that I was able to relate to most of the entries than I would care to admit. (Ah, no, I will not go into personal details, sorry. :P ) There were parts that made me reminisce years past, there were entries that could very well be verbatim entries lifted from my very own journal, and there were moments when I could just feel the love – and the pain, too – shared by our anonymous lovers, seeing myself in their place, and it made me fall in love all over again. That first night, you took your finger and pointed to the top of my head, then traced a line between my eyes, down my nose, over my lips, my chin, my neck, to the center of my chest. It was so surprising, I knew I would never mimic it. That one gesture would be yours forever. At first I wasn't sure if I wanted to read this but after reading yours and Tina's reviews, it does sound like something worth picking up (and getting lost in)!